LARS VILKS’ LECTURE CANCELLED IN SWEDISH UNIVERSITY……. – The Tundra Tabloids……. LARS VILKS’ LECTURE CANCELLED IN SWEDISH UNIVERSITY……. 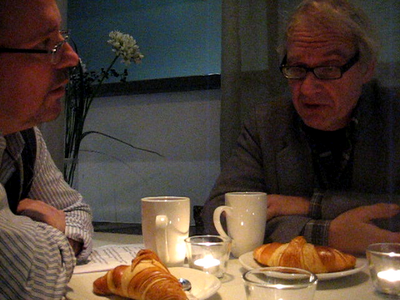 Artist Lars Vilks was invited by Jönköping University to speak about freedom of speech. But the seminar was canceled for security reasons. “I’ve understood that Muslim students protested,” says Lars Vilks. The politically independent Foreign Policy Association at Jönköping University was forced to cancel a lecture with controversial artist Lars Vilks. Vilks, who’s known in the Middle East for his cartoons of the Prophet Mohamed, was supposed to come to Jönköping on Thursday. But yesterday he was told that association canceled the lecture. Due to the security risk, the International Business School, the Culture Center and Hotel Victoria, all refused to offer their premises. “First we asked if we could have the event elsewhere instead of at the school, but we got the same answer from everybody that it’s the main reason,” says Johan Nordberg of the non-profit association. Have there been any threats? Lars Vilks definitely thinks that Muslim students are behind the protests. “I think it was the organizers who didn’t want to have it,” says Lars Vilks. According to Johan Nordberg they’ve had continuous contact with the police in Jönköping before the lecture Lars Vilks was suppose to give. The lecture was about freedom of speech. Previous Post Previous Post “YOUTH GANGS” RUNNING RIOT IN MALMÖ: HARASSMENT AND THREATS RULE THE DAY……. Next Post Next Post SHOCKING CLAIM IN TURKEY: NOAH’S ARK FOUND……!